First off, if you're a regular Jalopnik reader, this article isn't exactly for you. You know this. I've even been a jerk and made fun of folks who don't know this, because, again, I'm a jerk. But we've realized how many folks still don't know this, so we want to help. So we're starting JaloPSA, where we have simple, sharable tips for your car-ignorant friends. So, here's our first Public Service Announcement: on nearly every modern car (but not all — I'm looking at you, MINI) the fuel gauge will have an small, triangular arrow indication what side the car's fuel filler is on. The arrow is almost always next to the fuel pump icon, which looks a bit like a robot scratching its head. 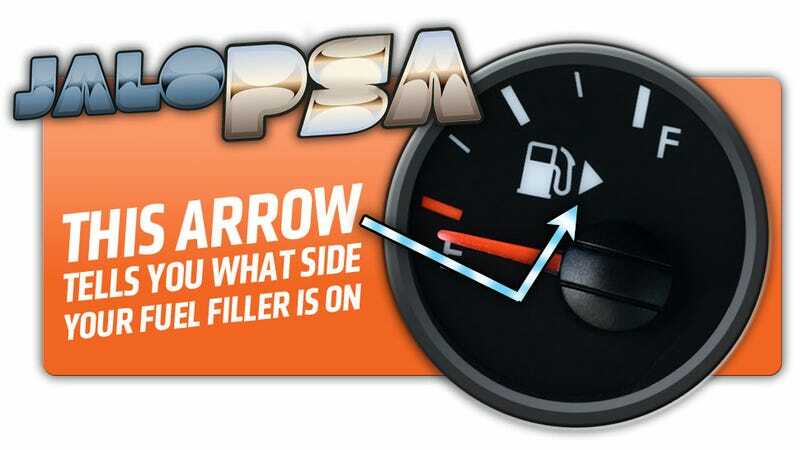 Since the center-mount filler has been made illegal for safety reasons, and dual fillers are cost prohibitive, and nobody can get the whole car industry to just agree on a particular side, that little arrow is your best bet for knowing which way to pull up to the gas pump. Now, for all of you who knew about this super-secret yet well-documented arrow, please send this to your friends still in the dark, wasting their lives by having to get back in their car and turn it around every time they go to get gas.